BBC Sport takes a look at 35-year-old Wambach's legacy and retirement plans. Wambach was born on 2 June 1980 in Rochester, New York, the youngest of seven siblings with two sisters and four brothers. After a successful college career at the University of Florida, she made her international debut against Germany in September 2001. She has since competed in four consecutive women's World Cup tournaments, finally winning the title when she helped the United States triumph in this year's tournament in Canada with a 5-2 victory over Japan in the final. Her impressive honours list also includes two Olympic gold medals - from Athens 2004 and London 2012. She missed the 2008 edition which the US also triumphed in, having broken her leg prior to the tournament. In 2012, she was named Fifa women's world player of the year, becoming the first American to win the award for 10 years. 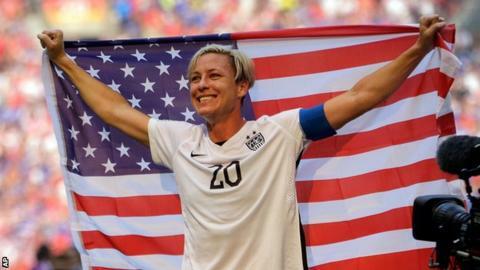 The mayor of Rochester declared 20 July 'Abby Wambach day' and the striker was given a key to her native city in 2011. During her club career, she played for Washington Freedom, magicJack and Western New York Flash at the professional level. Wambach scored her first international goal in a friendly victory over Finland in April 2002, beginning one of the most remarkable scoring records in football history. Her tally stands at 184, having scored 23 times in major tournaments including 14 World Cup strikes, the last of which came against Nigeria earlier this year. In a fitting quirk of fate, she scored her 100th international goal in her hometown of Rochester in July 2009 during a 1-0 win against Canada. Almost four years later, she surpassed childhood idol Mia Hamm's record of 158 goals by scoring four times in a 5-0 thrashing of South Korea. Renowned for her aerial ability, Wambach has scored a remarkable 77 headed goals in her international career, with her most famous goal coming in the 122nd minute of the 2011 World Cup quarter-final against Brazil. She rose to head in Megan Rapinoe's cross and send the tie to penalties, which the US won. Wambach spoke to BBC Sportsworld during the week building up to her final game and reflected on her decision to announce her retirement in October. "My decision to retire was an evolution over the last couple of years, but the reality is that we hadn't won a World Cup so that being the case I was grinding it out for the last year and a half," she said. "As you get older it becomes a little bit more difficult to get up for training, to play in games and recover and to keep that passion and that fire burning alive - once that starts to fizzle away, it becomes very clear. "You just get to a certain point in your life, especially since I've announced it, mentally it's kind of difficult to muster that real competitiveness I've had for so long. "If we had won the 2011 World Cup [Japan triumphed that year] and then the 2012 Olympics, I probably wouldn't have continued playing, but because I did carry on and we won this World Cup, the minute the whistle blew in Canada I knew deep down it was time to walk away. "I'm lucky I've been able to play for this long - I've given everything I possibly could to the game and I'm walking away happy as a World Cup champion, a two-time Olympic gold medallist and I've been able to travel the world and learn about different cultures." Wambach has already waved goodbye to many of her fans during her country's 10-city World Cup victory tour, but says her final appearance will be an "amazing experience". She added: "It could go one of two ways, I don't think it's going to be anywhere in the middle. "It's not going to be like I'm kind of sad or kind of happy - I'm either going to be a wreck and can't keep it together or I'm just going to be happy. "It's going to be completely one or the other and let's hope if it is me being a wreck that I have a pretty 'face cry' rather than an ugly 'face cry'. My team-mates will be pointing fingers and laughing if it's the latter." Wambach has previously stated her plans to start a family with wife Sarah Huffman, also a former US international. She also hopes to focus her time on tackling gender equality, inspired by her experience of the pay gap between men's and women's footballers, and has also called for more women to be involved in world football's governing body Fifa. Yet for now she is relishing the leisure time that comes after retirement, secure in the knowledge the legacy of US women's football will endure. "I literally have been as social over the last couple of weeks as I have maybe over the last few years," she added. "Usually I'm just in my room watching TV shows, getting ready for the next practice but I don't have a next practice to get ready for so I'm just trying to spend as much time with my team-mates as possible now. "The team is in good hands and I can walk away feeling solid that this team is a culture, it's never about one player, and I feel confident this team is not only going to do well but in fact it's going to thrive."